What’s the longest you’ve had to leave your dog at home while you were away? Needless to say, those days must have been harrowing for you. Not knowing what your dog’s doing, whether your dog has eaten or not, can be very stressful. Especially, when you realize that your fur baby has no way to know where you’ve gone and when you’ll be coming back. In the most extreme of situations, we have all heard about dogs who kept waiting for an owner who never came back. 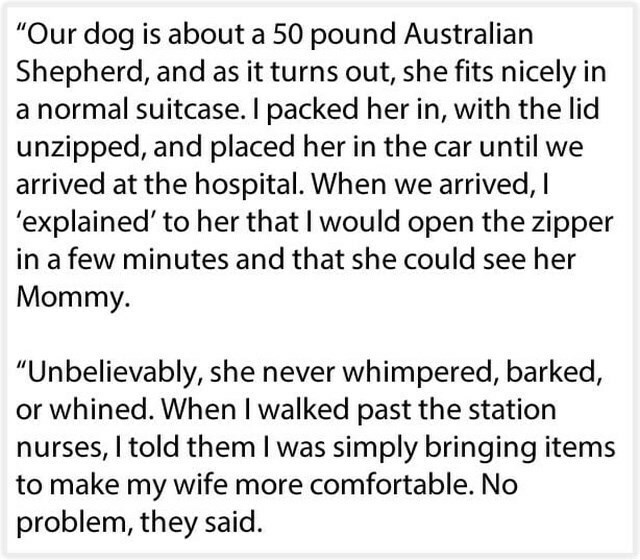 A story along similar lines has been making the rounds on Reddit and its leaving people in tears. 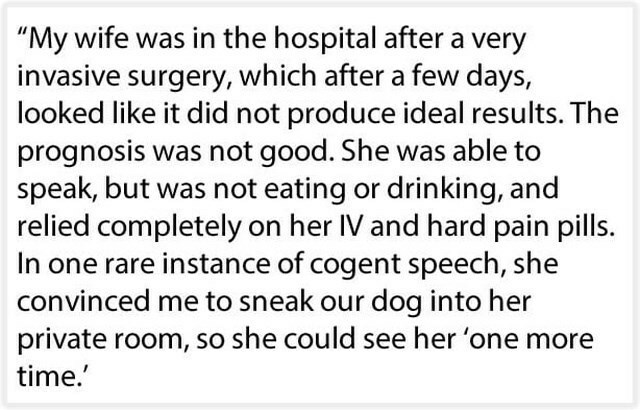 The user posted this small but emotional experience that involved his dog, Bella and his sick wife in the hospital. This guy’s wife was in a pretty bad condition. They were not hoping for her to make it. Lying in this unconscious condition, she tells her husband to get her Bella, her girl. She couldn’t stand not meeting her for such a long period. The husband knew he had a mission on his hand. With great stealth and twisting words a bit to avoid lying, Bella and her dad made it to the ailing woman. It’s baffling to think about how this dog knew not to make a sound while sneaking in. However, what happened next was all the more unbelievable. Is Bella too smart for her kind? It certainly looks so! This act of loving compassion even moved a nurse to favor them. Removing that dog would have been a cruel, cruel thing to do. After spending over an hour with her mom, it was time for Bella to go. She obliged when her dad cued for her to move into the suitcase and they went back home. How we wished to read something different at the end! But that’s how life is and dogs don’t know that. They surely don’t deserve what Bella went through. We can only hope that someday she’ll stop waiting. Do you have a moving story to share too? Let us and other doggo parents know in the comments below.